The lastest piece of fan art that I finished was of Capcom’s Mike Haggar. For video game players ‘sometime in the 1980’s’, Mike Haggar was the best mayor ever. He was introduced to us in 1989 in Capcom’s game Final Fight, a game that was originally planned as Street Fighter ’89. Mike Haggar’s bio states that he was formerly a Street Figther and a pro-wrestler before becoming a mayor. Yes, this was long before Jesse the Body Ventura threw his feather boa and funky sunglasses into the political arena. So you wonder what kind of place would elect a former brawler and wrestler as mayor. That’d be Metro City (or New York in the Japanese versions), a city filled with violent criminals and corruption that runs from the police force to the previous Metro administration. So Mike Haggar gets elected and declares a war on crime. No, not like real-life politicians do, but in a way that gets the attention of Belger, the Kingpin of Metro City, angry enough to kidnap Haggar’s daughter Jessica. Haggar gets two options: agree to let Belger’s Mad Gear gang to run the streets or never see his daughter alive again. Did Haggar cave? Hell no! Haggar got Jessica’s boyfriend Cody and his ninja friend Guy to beat the hell out of the gang and get his daughter back. See, that’s how you get my vote. For one, he stands up against corruption. Even better, he has ninja friends. Could you imagine a mayoral campaign that says “Mike Haggar for Mayor: He has ninja friends” at the end? I sure could, but I’m just a dreamer. 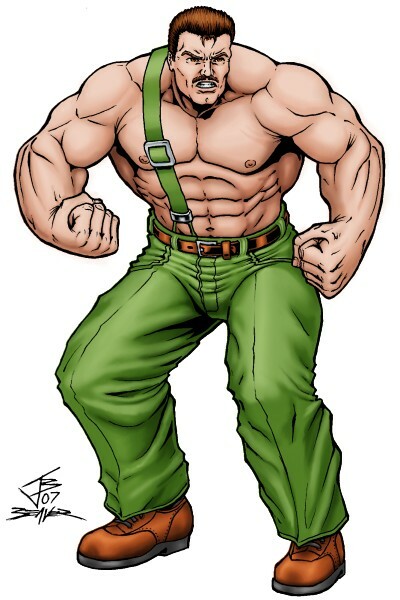 After the three heroes rescue his daughter, Mike Haggar makes appearances in Final Fight 2 & 3 and is a star of Capcom’s wrestling series, Saturday Night Slam Masters. If the 3-D title Capcom Fighting All-Stars would’ve been finished, he’d have been in that, too. Personally, I’d love to see a game where Capcom gathers all of it’s wrestlers into a new 3-D wrestling game. Get Haggar, Zangief, R.Mika, Hugo/Andore (with a final explaination of whether that’s Andore from Final Fight or not), Abigail, Alex, Birdie (also a former wrestler and Titanic Tim’s ex-tag partner), all of the Slam Masters characters and any other wrestlers they can throw in there, including some new ones. While I’m dreaming, get Slam Masters character designer Tetsuo Hara (best known for Fist of the North Star) to draw some official artwork for it.